Today is one of the stranger food holidays this year. Not the ingredients themselves so much as the combination of ingredients. Oatmeal, nuts, and waffles are all celebration-worthy (and each, in fact, has its own national food holiday). But whoever heard of oatmeal nut waffles? It’s an oddly random day to celebrate. But as I’ve said before, we don’t make the rules, we only follow them. 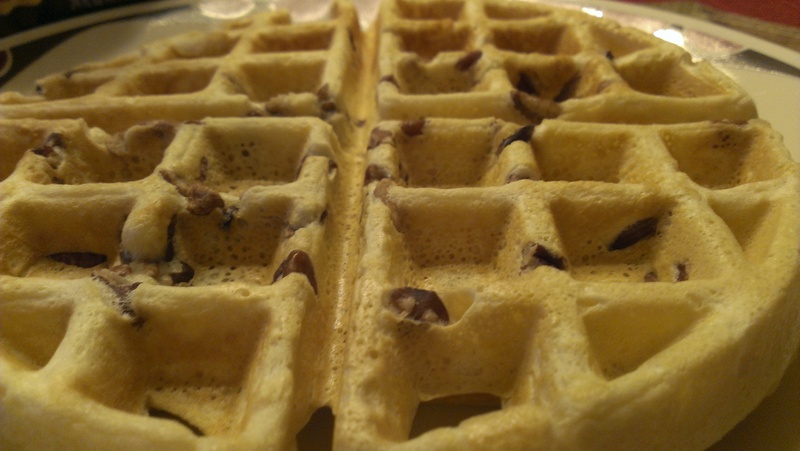 So a hearty, happy National Oatmeal Nut Waffle Day to you and yours! Waffles are essentially communion wafers on steroids. The two emerged at the same time, in the 9th century, and both were initially flavorless discs made with grain flour and water. Early waffle pans were made of iron and depicted images of Jesus and the crucifixion. It took 200 years for folks to realize that waffles might taste decent if they had a little flavor, so ingredients like orange blossom water and honey were added. The first known waffle recipe was published in the 14th century, and read: Beat some eggs in a bowl, season with salt and add wine. Toss in some flour, and mix. Then fill, little by little, two irons at a time with as much of the paste as a slice of cheese is large. Then close the iron and cook both sides. If the dough does not detach easily from the iron, coat it first with a piece of cloth that has been soaked in oil or grease. Hey…why isn’t today National Wine Waffle Day?! Harumph. Modern waffle irons first appeared in the 15th century, with the classic grid shape emerging soon after. Waffle recipes became more sophisticated, with the additions of sugar, butter, and eggs. Dry waffle mix was developed in the 1930s, and the Dorsa brothers from San Jose, California developed a frozen waffle they went on to name Eggo in 1953. Belgian waffles – larger and lighter thanks to the addition of yeast in the batter – were introduced at the 1962 Seattle World’s Fair, and quickly became popular. Americans liked the texture and the bigger squares and deeper pockets, perfect for holding melted butter, syrup, spare change, and lint. 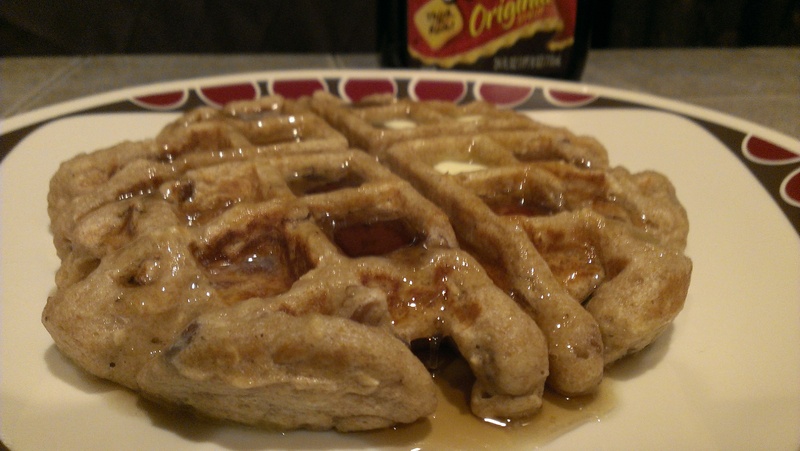 In researching recipes for oatmeal nut waffles, I discovered something interesting: they are very healthy, made with whole wheat flour, and honey in place of sugar. Flush with my baking success yesterday, I whipped up a batch this morning while Tara was getting ready for work, using pecans for the nuts.The waffles were very dense and not at all sweet, but that’s why they invented syrup. Overall they had a good flavor. Tara and I talk about opening a restaurant someday, and these would be a good addition for the health nut/vegan crowd. I doubt I’d make them again, but they did turn out pretty good. Today we celebrate peanuts. And chocolate. Together in one sweet, salty little bundle. It’s National Peanut Cluster Day! Peanut clusters have been around for about a hundred years or so. The Standard Candy Company of Nashville, Tennessee came out with the GooGoo Cluster, a round candy bar containing marshmallow, caramel, and peanuts, covered in chocolate. It is considered the first combination candy bar, made up of several different types of candy rather than an all-chocolate chocolate bar. Kind of like the mutt of the candy bar kennel, if we’re stretching for analogies here. During the Great Depression, the marketing slogan for GooGoo Clusters proclaimed them “a nourishing lunch for a nickel.” The FDA would have a field day with that today. Here’s an interesting story on a company whose own peanut cluster recipe dates back to 1912 or 1913. They are bucking the manufactured-by-machine trend and bringing back their original recipe peanut clusters, making each one by hand. If you happen to be in Bryan, Ohio, stop by the Spangler Store & Museum and pick some up! 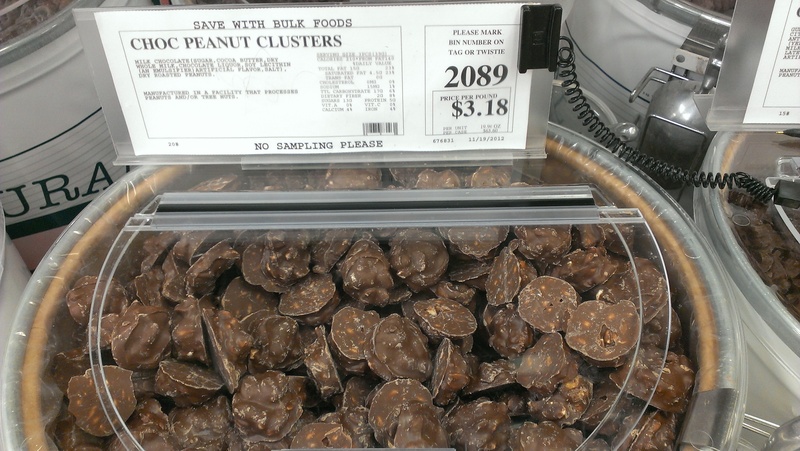 I bought peanut clusters from the bulk foods section at WinCo. I doubt they were handmade, but they still tasted pretty good! It’s hard to go wrong with that combination of sweet and salty. Just ask the folks who created chocolate covered bacon (which, unfortunately, is not a food holiday). Tara and I ate them in the car on the drive to Seattle, where we’re headed for the weekend. Today we had a sticky dilemma: should we pay homage to peanut butter or fruit compote? It’s Friday and we’ve got plans tonight, so we decided to go the easy route. Besides, January 24 was a dual food holiday, but we chose lobster thermidor over peanut butter then. Today makes up for it. Happy Peanut Butter Lover’s Day! (The other holiday was just Peanut Butter Day. Today is more special. Like Virginia, it’s for LOVERS). Several people claim to have invented peanut butter, but the Aztecs were the first to turn peanuts into paste, around 950 B.C. Boy, those guys had their hands in a lot of early foods, didn’t they? We can thank John Harvey Kellogg, the cereal baron, for attempting to modernize peanut butter: in 1895 he patented a process for creating peanut butter out of raw peanuts. He served this early version to patients at his sanatorium in Battle Creek, Michigan. “They’re gr-r-reat! !” these patients declared, but they were talking about Frosted Flakes. Kellogg’s nuts were steamed instead of roasted, which sounds painful and translated into a rather bland flavor profile. Dr. Ambrose Straub invented a better peanut butter making machine in 1903. In 1922 a chemist named Joseph Rosefield developed a process for making peanut butter that was smooth and creamy, and would keep fresh for a year. He sold his invention to Swift & Company, who changed their name soon after to Peter Pan. A few years later he was like, what have I done, this invention is a goldmine, and started his own company, Skippy, in 1932. In 1934 he created the first chunky peanut butter. In 1958 Procter & Gamble got in on the action by introducing Jif; now they operate the world’s largest peanut butter plant, churning out 250,000 jars a day. Fun fact: a slang term for peanut butter during World War II was “monkey butter.” Whoever came up with that was bananas. Today was a rare challenge that Tara and I completed separately, due to time constraints and work schedules. 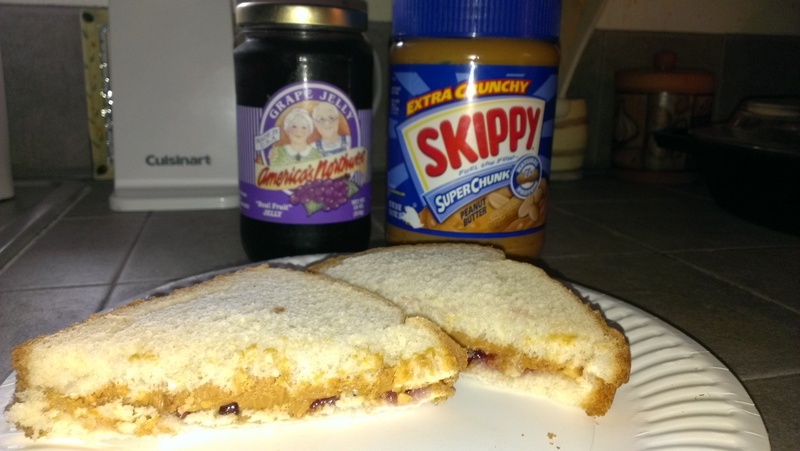 I had a classic peanut butter and jelly sandwich for lunch (Extra Crunchy Skippy – thank you, Mr. Rosefield! ), while she indulged in a Reese’s peanut butter-filled chocolate egg. Today’s holiday honors a food that appears to be smiling back at us: the pistachio. Aww. I almost feel guilty eating the poor little fella. Pistachios have been around since at least 6750 BC. They grow on trees and are related to mangoes, sumac, and poison ivy…so if you’re itching for a handful of pistachios, now you know why! They are native to the Middle East, and are believed to have grown in the Hanging Gardens of Babylon. Like almonds, pistachios are the seed of a fruit rather than a genuine nut, like Charlie Sheen. Pistachio trees were introduced to the U.S. in 1854, and grown commercially beginning in the early 20th century. 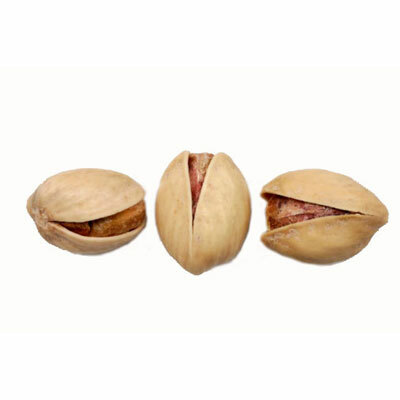 In the Middle East, pistachios are referred to as “the smiling nut” and in Iran they are called “the happy nut.” In America, those nicknames belong to Lindsey Lohan and Gary Busey, accordingly. (These “crazy celebrity” jokes never get old!). They are very healthy for you (the nuts, not the celebrities), containing more antioxidants per serving than green tea. They are a great source of fiber, copper, manganese, and vitamin B6. The shells are recyclable, too: you can use them as kindling with crumpled paper to start a fire, line the bottom of houseplant pots with them to provide drainage and soil retention, and use them as mulch for plants and shrubs. The shells are sometimes dyed red or green because holiday colors are festive and pretty!! Actually, it was to hide the stains from the grubby farmhands who used to pick the fruit by hand, but nowadays pistachios are machine-harvested, so dyeing is rarely performed anymore. For today’s challenge, we wanted to do a little bit more than just open a bag of pistachios and eat a handful. 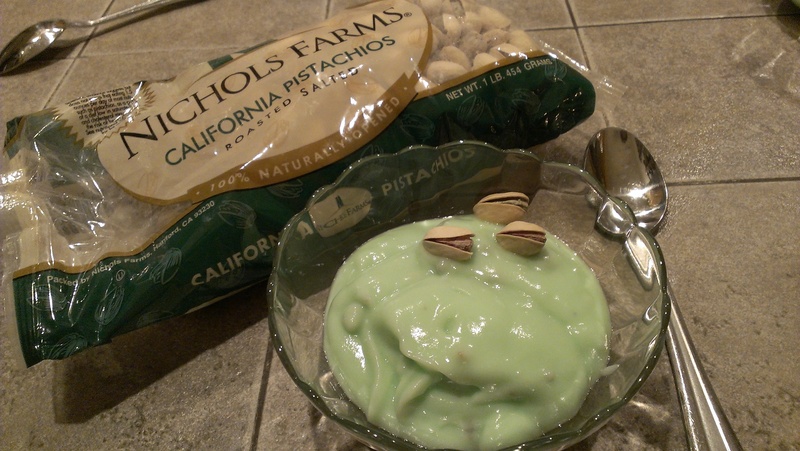 So, we opened a bag of pistachios and ate a handful…AND we made pistachio-flavored instant pudding. Double pistachio whammy, people! Today is National Peanut Brittle Day. Why we call this hard candy “brittle” is a mystery, for it is anything but. Liable to break or shatter easily? Peanut brittle sometimes requires a mallet to break apart into pieces! OK, I exaggerate. And I have to say, it’s really, really good. Tara’s mom sent us a bunch of treats for Christmas, including homemade brittle. 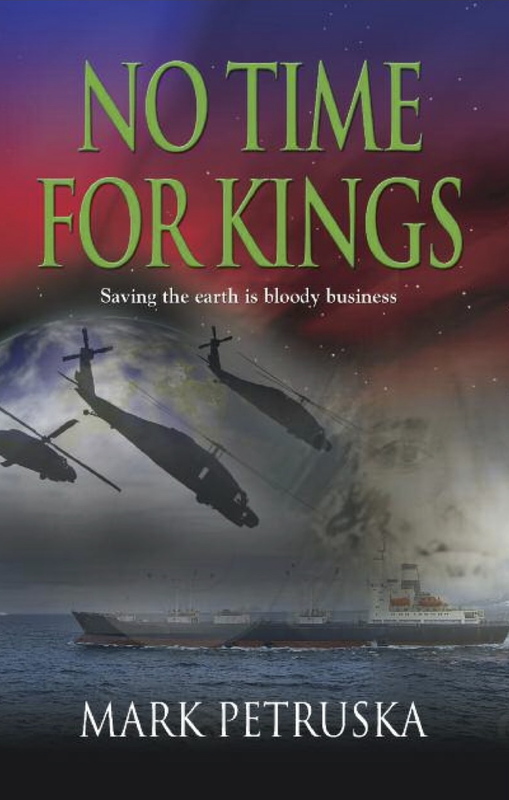 Why we didn’t save a little bit for today is a good question! Brittles are one of the oldest candies around. When not busy hunting leprechauns or picking four-leaf clovers, the Irish enjoyed eating sugar coated peanuts as snacks. They began adding syrup, and brittle was born. There are many variations around the world. The Greeks have pasteli, the French have croquant, Indians have Gacchac, and Canadians have peanut brittle, eh. In the Middle East it’s made with pistachios, and in Asia, a mixture of sesame seeds and peanuts. 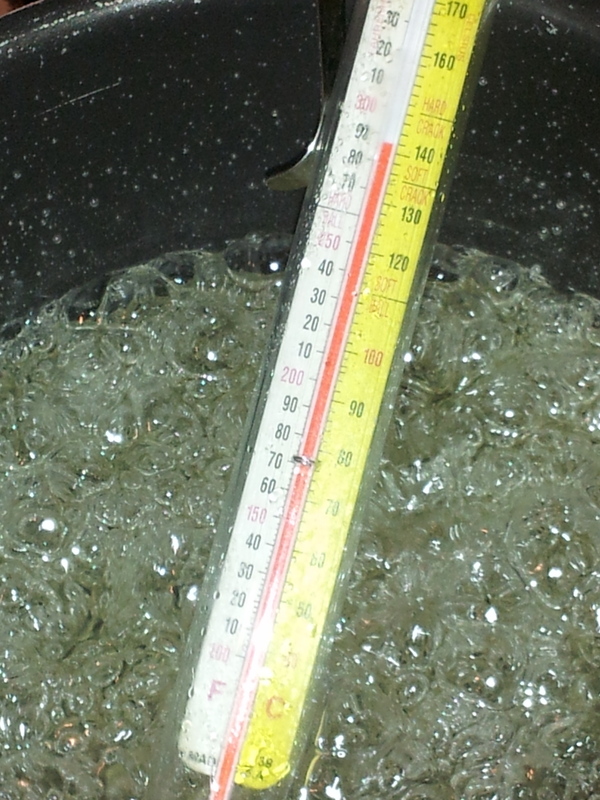 Tara workin’ that candy thermometer to the “hard crack” stage. Thanks, John! Tara and I have already learned a lot, and feel like our own food horizons are expanding with each day that goes by. If you don’t mind, you can be our official “culinary consultant.” I may have a need for suggestions as we plow our way through the year! Back to today. We sort of found ourselves scrambling late in the day, because our calendar had erroneously listed National Pistachio Day twice: January 26 AND February 26. So much for the bag of nuts we had sitting on the counter. A quick run to the grocery store yielded no peanut brittle, but Tara had a recipe in her trusty Fannie Farmer cookbook, and whipped together a batch of brittle. 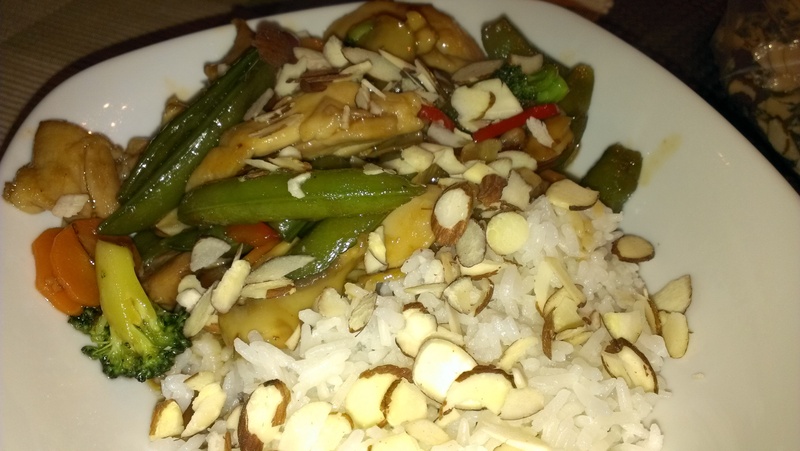 Start to finish, it took less than an hour – and turned out very tasty!